A hero is not a real hero without his equipment. A regular sequence of fitting, polishing and upgrading is what every champion does since birth. But here in Godville equipment wasn’t that much useful… up until today. Multiple items can have buffs at the same time, which opens a lot of interesting combinations. Buffs won’t give any advantage on arena or dungeons, so no need to worry about (im)balance. Also, buffs are temporal and they will expire after about a day. If you’re playing on a phone (Android, iOS or Windows Phone) make sure to update Godville app to the latest version available in the store to see equipment buffs. A bit of economy news: a roadside trader was finally caught by the local authorities. It turned out that he was ruining the lives of our poor heroes in their moments of their total weakness by depriving them of their loot for cheap. After long negotiations the roadside trader finally agreed to start paying double for the loot and not buy boss parts for the lab. Last, but certainly not least: a well-known, yet humble god Hairplug4men recently outplayed the game by collecting all of the top-level achievements. First time ever in Godville history. Quite an accomplishment we must say. The new year has just begun, yet we already have a few little things to share. Bounty givers decided to up the reward for wanted monsters in Godville Times. Handing over a proof of a wanted monster can now bring twice as much gold or even better: a wood log or a manimal. Also, these beasts should be a lot easier to come across, especially for a hero with an aura of hunting trail. Healing pets have learned a new trick. They can now help their masters to heal not only in travels, but in towns too. On guild leader elections. They will be a bit easier from now on – electing a candidate require 25% of votes (instead of 30% like it was before). There is also a new rule for big guilds: just 50 votes will be enough for election to succeed, which should a lot simpler. Finally, let’s welcome new varieties of side jobs. Now heroes can entertain themselves by collecting auras, trying on equipment or tracking their sleep. January on the GodWiki will be a month-long content drive, dedicated to creativity and inspiration, centered around the topic of beer. It is organised by players for players, to encourage and celebrate creativity on the GodWiki. If you enjoyed reading Godwiki articles (or better – thought about writing one) make sure to check it out. Winter holidays are at the doorstep. Godville is ready to welcome them with regular Christmas Special. Please take a sit while we walk through it. The most peculiar thing is winter snowflake ❄ – a god can spot it in the hero’s inventory. There are few ways to get them: a hero can knock one out of a monster or fish out from an ice-hole… Snowflakes are actually useful. First of all, you can use them as a bingo wildcard in Godville Times. Secondly, if a hero get a bunch of them, he could make a snowman and get some presents after heroically beating it. Finally, these snowflakes can be sold to traders for a good price. Next are traditional seasonal presents – Christmas gifts. There should be plenty of them in the fields. Besides of the regular goodies, during this season they could yield a log of gopher wood, replenish godpower or give a nice chunk of experience. Of course, these artifacts can be activated for free. By the way, there is a quick way to get a gift – each bingo extraction will give one right away! And of course there are special Christmas critters. This time we have a whole bunch of Christmas reindeers – hunt them for the snowflakes! More conventional Santa Clawses and Satan Clauses (tameable with some luck) are grazing in the snow-covered fields too. Finally, let’s not forget the festive tent-town of Laplandville, known for its great holiday discounts and other bonuses. Very soon it will conveniently appear next door to Godville. This Christmas Special will last until January 2. Happy holidays! Godville is slowly but surely expanding on both width and depth. It all started with a browser game, then iPhone, Android and even Windows Phone apps were released. Еvery god should have easy access to their hero, right? 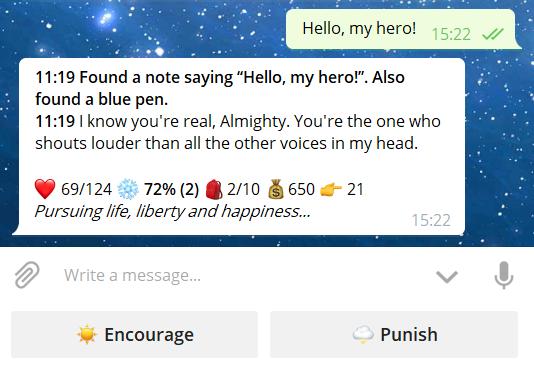 So let’s welcome a new addition to the herd – official Telegram bot @godvillegame_bot. It’s not a full-fledged alternative for the mobile app or the web site, but it could be useful for quick status checks, revivals or occasional influences. It should also be handy if push notifications are not very reliable and you want an alternative notification channel. If you’re just beginning your divine journey, treat this bot like a demo. You can learn more about the bot in this forum topic. A bit unrelated, but certainly good news for those with a Lab, already collecting boss parts. Unlike dungeons, where boss parts are plenty, finding them in ZPG-mode was not so easy. Not anymore. From now on, a hero can get a boss part for lab while fishing. Rumor says that various parts can be found in ponds and lakes, even from the really strong bosses. Finally – as you noticed, the winter is here. In this time of the year heroes enjoy fishing without a bait and sailors can preserve their precious supplies on sea icebergs. Hello there, dear gods! We have three interesting things to share today. Do you remember recent episodes of mass town building and map making? Here is the cherry on that cake – the town of Heisenburg. A town with such a name just has to be special. Indeed, it moves around every day, and changes its properties as well. Sometimes heroes die. That’s the law of Godville nature and nothing can be done about it. However, some after-death presents could brighten up the long wait for resurrection. From now on, after resurrection the hero will keep whatever the mourners have left on his grave while he was lying lifeless. The longer hero has waited, the more sweet things he will have once he comes alive. There is never too much godpower, right? We agree, so here is the last new thing – a new activatable artifact that replenishes your godpower. Best of all – it can be used for free. Free godpower, yay! Remember the swirly map that heroes discovered couple months ago? Today it gets swirlier. Once a hero defeat a monster (especially a strong one, with a special mention in the diary) he may learn about a particular spot on the map. Upon reaching this point of interest he may find something cool: а health boost, a new aura, an extra prayer… you get the drill. In the best tradition of ZPG it doesn’t require any action from the god. If a hero couldn’t hit the point for some reason — no problem, there is always another one ahead. Another map thingy: thanks to your submissions, five (!) new towns are proudly placed on the map. New addition for spelunkers — dungeon of abundance. Almost every room in it has something good (or bad), making the exploration more exciting. Please welcome a sails novelty — dead sea. Abundance of reefs makes this sea almost free of the beasties. And last, but certainly not least — mutating bosses. These creatures can change their abilities on the go, right in the middle of the fight. Surely it will add some drama to the boss battles. Town list in the Guild Popularity section of Godville Times now includes distance for each town. Note that towns without enough guild influence are not present in the newspaper. Problem catching up with game updates? Worry no more — now you can search all game news and find more about the game features as they were added. All these changes are already live and don’t require mobile app update. You’ve probably been receiving a lot of emails about the changes to how your data is kept and managed. We’re tired of it too, so let’s keep it up to the point. And what’s up with game news without new features? So here it is: from now on you can update your email as many times you need or even request deletion of your account. Hopefully, you won’t need the last one – but in case your will, head to the app’s settings in the newest Godville app (already being rolled out and will be available over the next couple days) or here. Taking care of you, Devs. Today Godville turns eight. Yay! Lets cheer each other and celebrate this special occasion. All the best wishes to gods in the clouds, heroes in the fields, creators in the ideabox and helpful guildmates. Send a congratulatory god voice to your brave champion and get an anniversary pack of charges. Do that for the next 3 days to get this bonus trice! Cheering while dueling, sailing and spelunking could grant extra bonus.